Howdy I'm Flick, food lover,owner of too many house plants and awkward introduction writer. Like Lauren, if I'm not out exploring or eating, I'm blogging about it over at They Called It The Diamond Blog. But today I'm guest posting for Lauren while she's sunning herself, cocktail in hand, in Mexico, and I'm not at all jealous. What am I doing while Lauren is jetting off on holiday? 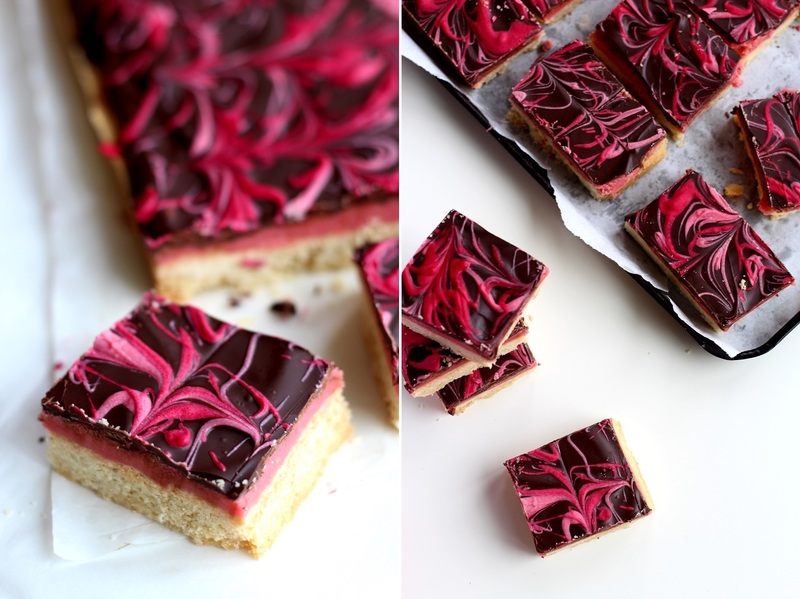 I am sitting here stuffing my face with Raspberry Caramel Millionaire Shortbread. 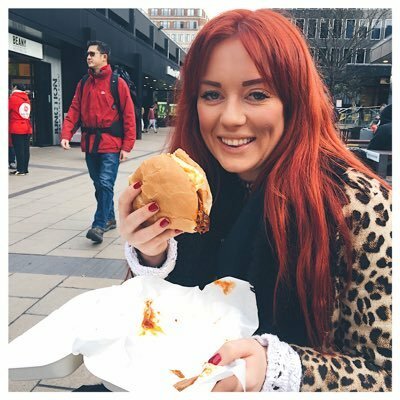 I can see how this could look like I'm comfort eating myself into early diabetes because I'm envious that Elle is having an amazing time on holiday and I'm not. But it's not like that. 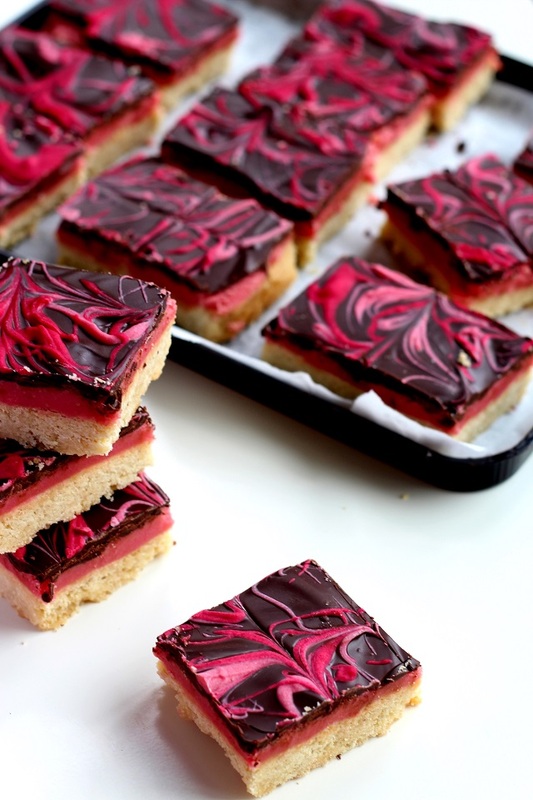 The truth is I've eaten four of these Raspberry Millionaire Shortbreads and am having the best time! Ok, so I'm a little sugar high (make that a lot), but honestly this is the first time I've made millionaire shortbread and I'm just going to throw modesty to the wind and say that they are A-M-A-Z-I-N-G! Yeah I know, I'm making a bad/arrogant first impression but look at them! 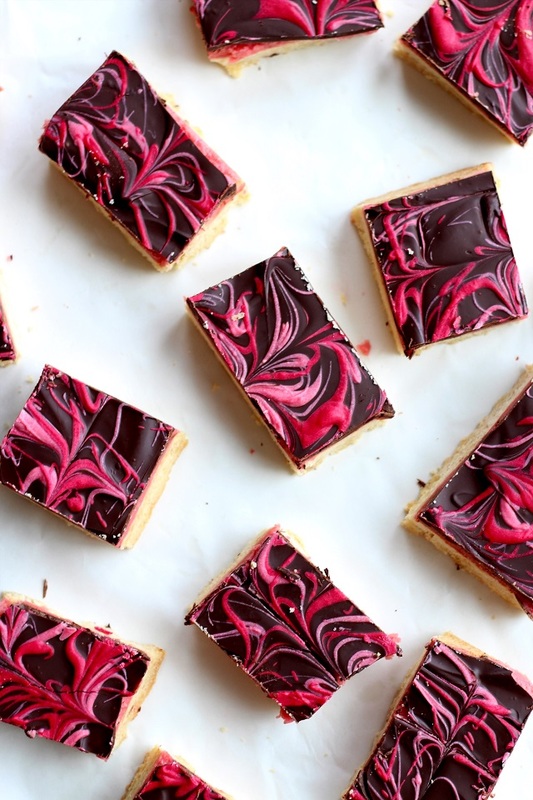 These pretty shortbreads are bound to impress with their pink marbled topping and strong raspberry flavour. But the best bit is that they only take an hour and a half to make, including the time they take to set, that is unless you've forgotten about them because you've been watching too many episodes of Humans (my new, now not-so-secret, guilty pleasure)! I love raspberries, they're one of my favourite Summer ingredients and perfect to make this caramel tart and fruity, which is a great contast to the rich dark chocolate topping. If you don't like dark chocolate you can try making the topping with milk chocolate or even half and half. Don't skimp on the quantities though, if anything more chocolate and caramel is a big plus. This sounds like I'm dissing the shortbread, I'm not. It's a decent shortbread, but I'd much rather have more caramel and chocolate than biscuit. Always...except when the biscuit's a brandy snap...anyway on to the shortbread! Step 1. Preheat the oven to 180°C and line a tin with greaseproof paper (I used a 30cm one). Cut the butter into cubes and place in a bowl, sieve in the flour, and rub the butter and flour together till it resembles bread crumbs. Sieve the sugar into the bowl and mix it all up with your hands, bringing the dough together into a ball. Step 2. Place the dough on to the lined tin and press the dough into the tray with your fingers till it covers the entire tin and is about 1cm thick. You can then use a back of a spoon to smooth out the dough to make it flat. Bake the shortbread in the oven for 20-30 minutes until lightly golden. 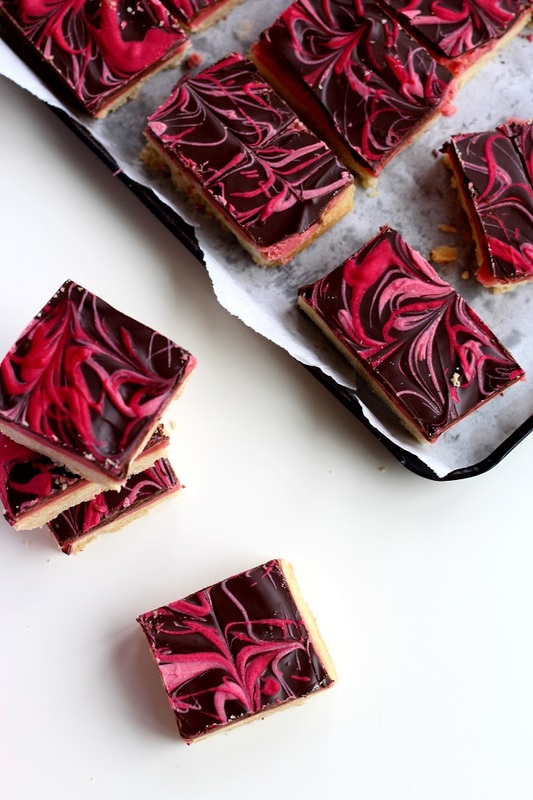 Once cooked, remove the shortbread from the oven and leave to cool (you can take it out of the tin to make it cool down quicker, just remember to put it back in the tray before you pour the caramel and chocolate on, otherwise you will be the owner of one messy kitchen). Step 3. While the shortbread is cooling you can make the caramel. First, place the raspberries in a saucepan on a medium to low heat with a couple of tbsps water, break the raspberries up with the back of a spoon and leave to simmer for 5-10 minutes until it looks like a thick coulis. Sieve the raspberry sauce to remove the pips and set it aside. Step 4. Melt the butter and sugar in a saucepan, stiring till the sugar has dissolved. Then add the condensed milk, raspberry sauce and a tiny bit of pink gel food colouring (optional for those who prefer their caramel eu naturel) and stir the mixture till its thickened. Be warned it might spit at you if it gets too hot and no-one wants that! Once thickened remove it from the heat and leave to cool slightly, it will continue to thicken as it cools so once it is the right consistency you can pour it on to your shortbread. When the shortbread is evenly covered with caramel, place it in the fridge to set for 15 mins. Step 5. While the caramel is setting, melt the dark chocolate. Do it anyway you like, saucepan, microwave, the old trusty glass bowl trick, the choice is yours. Once melted pour the chocolate over the caramel shortbread and spread with the back of a spoon. Step 6. Working quickly melt the white chocolate, for this I'd do it in a glass bowl because it's easier to control the temperature. However, if your white chocolate goes a bit solid or grainy you can always add a bit of vegetable oil to it to make it smooth again. Add a little pink food gel to the white chocolate and mix it up, flick the now pink chocolate over the dark till you're happy with the result. I used a lighter and darker pink chocolate, by adding a little more gel colour after I'd used half the chocolate and then flicking that over the top. 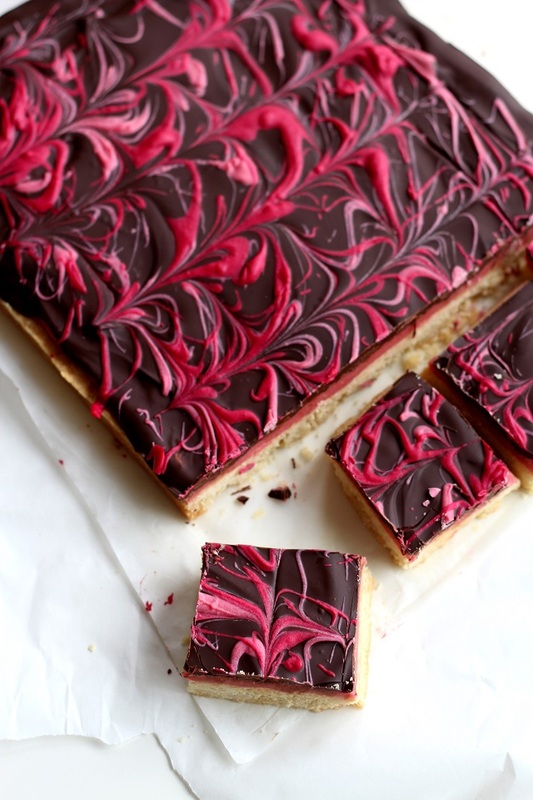 Then take a cocktail stick and run straight lines through the chocolate vertically and horizontally to create a feathered effect. Step 7. 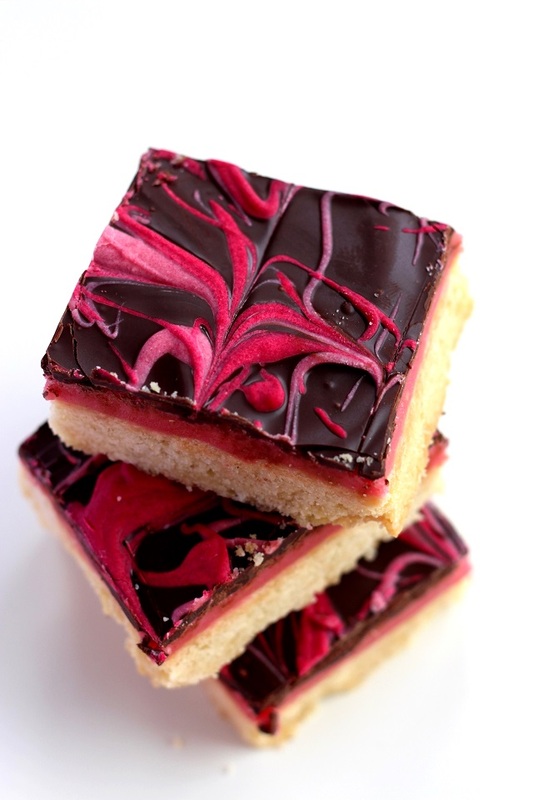 Leave the shortbread in the fridge till the chocolate has set, then cut into squares and eat one as a test subject. Then eat a second one for quality control. And a third just because. Thank you so much Lauren for having me on your blog and I hope you have an amazing holiday! For more recipes and explorations find me, Flick, at They Called It The Diamond Blog. This looks amazing! I am definitely going to make this !